The Troutdale Art Center will be having their Grand Opening on Friday, February 6th 2015. This art center will be hosting eights artists who will have enough space to create large pieces of artwork that in other locations would not be possible. 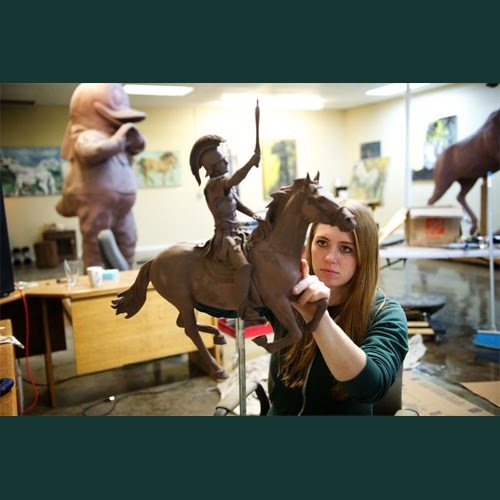 The pushing force behind this art center was Allison Brown, who has been sculpting giant sized Ducks for the University of Oregon for the last three years. Encouraged by Rip Caswell's success as a full time artist Brown sought out a large enough working space for her giant sculpting and thus The Troutdale Art Center was born. Learn more about this new art center in Historic Downtown Troutdale below. Through this whirlwind experience, which started about two months ago, she said there’s really a demand for artist work spaces. Loree Harrell said she hasn’t had an outside studio in 12 years. Brown said she was lucky that the first applicants were amazing artists and people.